In 2013, the Centre continued to expand, diversify and strengthen its partnerships and networks in Europe, the ACP and beyond. We aimed to build relationships focused on the joint learning and innovation required to effectively adapt to the changing global context. We strengthened our relationships with key institutions in Africa and the ACP Group of States, and augmented our network of programme associates, especially in Africa. We also created more opportunities for staff to do fieldwork, particularly for our younger staff members. We increased the presence of Africans on our staff through the Young International Professionals Programme (YIPP) launched in 2013. This programme builds capacity among talented young professionals from the ACP region in the area of international cooperation, by recruiting them to ECDPM for a minimum period of seven months and a maximum period of one year. In doing so, we provide opportunities for exposure to Brussels-based institutions while also better integrating African perspectives into our work. While recognising our role as an independent broker, the implementation of our strategy nonetheless requires sustained and flexible funding. At the start of the year, the Centre was unsure whether it could maintain the required levels of flexible institutional funding. Fortunately, through an intensive dialogue process with our longstanding institutional partners, the Centre did manage to consolidate its sources of multiple-year institutional funding. The Netherlands and other longstanding supporters - Belgium, Luxembourg, Finland, Ireland, Portugal, Sweden and Switzerland - assured us of their continued support. We were particularly pleased to welcome Austria as a new institutional partner. In addition, ECDPM embarked on more intense cooperation through programme and project funding with Denmark. The UK also continued to commission ECDPM’s expertise. At the level of the European institutions, we solidified our relationship with the European External Action Service (EEAS), especially in the areas of peace and security and EU-Africa and EU-ACP relations. We strengthened our collaboration with the European Commission, EU delegations and the European Parliament, and cooperated well with the Irish and Lithuanian EU presidencies (2013) in areas such as the post-2015 global development framework and EU support to transitions in Africa. We stepped up our engagement with an increasing number of global players. We reinforced ties with Japan and engaged in new relationships with official and non-state players in South Korea, Canada, Norway, the USA, China, India and Brazil. At the level of the global institutions, we continued our strong cooperation with the AU Commission and the Organisation for Economic Co-operation and Development (OECD). The World Bank, the African regional economic communities (RECs), the United Nations Economic Commission for Africa (UNECA) and an increasing number of international foundations showed growing interest in our work. 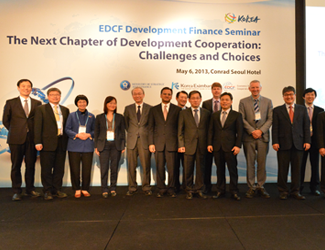 Finance Seminar in Seoul, South Korea, May 2013. A key element of our 2012-2016 strategy is to strengthen linkages between development and other areas of international relations and diplomacy. This led to increased interest in our work from institutions involved in conflict prevention, security, defence and migration issues. In addition, we drew increased attention from the private sector, from international financing institutions, departments of economic affairs and international trade, and players in the field of natural resources management, environment and climate change. In 2013, ECDPM and the Overseas Development Institute (ODI) completed an external evaluation of phase I of the international Think Tank Initiative (TTI), an innovative and ambitious multi-donor programme dedicated to strengthening the capacity of independent think tanks in the developing world. The evaluation provided us an opportunity to work with the Bill & Melinda Gates Foundation, the William and Flora Hewlett Foundation, the International Development Research Centre (IDRC), and the governments of the UK and the Netherlands. It also provided us opportunities to connect with influential and up-and-coming think tanks across the Global South. The year 2013 provided new impetus for strategic thinking on the Africa-EU and the ACP-EU partnerships. 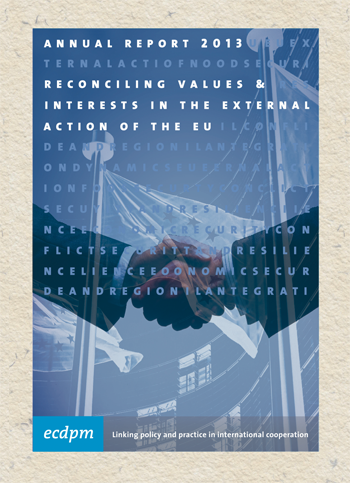 ECDPM, as a recognised leader in brokering partnerships between the EU and the Global South, was able to provide analysis and facilitation work for key institutions in Europe, Africa, the ACP and beyond. "A gradual change is taking shape in the culture of dialogue between Europe and Africa. Co-responsibility holds a greater potential for success than conditionality and unilateral imposition." The EU’s oldest development relationship is with the African, Caribbean and Pacific (ACP) Group of States. ACP-EU relations are governed by the ACP-EU ‘Cotonou’ Partnership Agreement, which is set to expire in 2020. Discussions on the future of this relationship and of the ACP Group itself gained momentum in 2013. As part of this, the ACP established an Eminent Persons Group and mandated it to look into future prospects for this group of states. ECDPM provided facilitation and analytical input to the ongoing reflection process on ACP-EU cooperation post-2020. We produced a background paper on the future of EU-Pacific relations and actively participated in the ACP Eminent Persons Group meeting in Samoa. Furthermore, we held presentations on future prospects for the ACP Ambassadorial Group and for the ACP National Authorising Officers. In these ACP-led processes we played the role of independent sounding board, providing background analysis and formulating critical questions to help open fundamental debates and advance reflections. Working together with the German Development Institute (DIE) and independent consultants we launched analytical work and papers on potential roles for the ACP Group post-2020. The Centre was also asked by European institutions, EU member states and NGOs to present views on the future of the EU-ACP partnership. To this end, we engaged in regular dialogues with the European Commission, the European External Action Service (EEAS), the European Parliament and the ACP-EU Joint Parliamentary Assembly. We organised a high-level informal dialogue between ECDPM’s Board and key ACP, AU and EU players to explore the complementarity between the Cotonou Agreement and the Joint Africa-EU strategy (JAES). This event was seen as particularly productive and welcomed by all sides. Our initiatives contributed to better informed ACP and EU policy actors. To advance the debates in the coming months and years, ECDPM will embark on a thorough political economy analysis of the interests on the ground in the various ACP regions and countries. ECDPM particularly contributed to the current discussions on the future of the Africa-EU partnership. African and EU actors and institutions sought us out regularly for analytical and facilitation input. We were the only non-African participants at several internal meetings, including consultations run by the Pan-African Parliament. With the other members of the European Think-Tanks Group (ODI, FRIDE and DIE) we facilitated a one-day high-level meeting that brought together key African and European policy actors. Outcomes were fed back into official events, including the biannual collective task force meeting for the Joint Africa-EU Strategy (JAES). The AU Commission subsequently invited us to co-host a follow-up meeting in Addis Ababa. Perhaps the most valuable contribution of our work was its influence on the preparations and ‘quiet diplomacy’ in the lead-up to the Fourth Africa-EU Summit held in Brussels in early April 2014. After a productive collaboration on the 2012 European Report on Development, ECDPM again joined forces with ODI and DIE for the report’s 2013 edition, entitled ‘Post-2015: Global Action for an Inclusive and Sustainable Future’. This time, ECDPM took the lead role in the team. The Centre received numerous invitations to present the report to European and African stakeholders and institutions as far afield as South Korea and India. 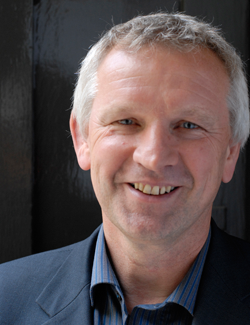 EU Development Commissioner Andris Piebalgs described the report as particularly timely and relevant. It has been widely consulted in the advancing post-2015 global development framework debate.